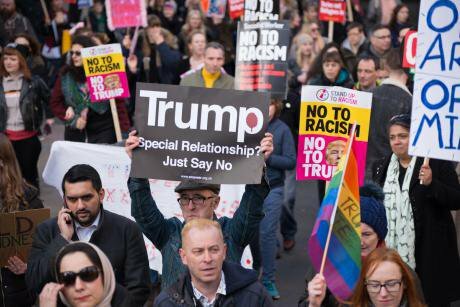 Today, on Monday 20th February, thousands of people around the UK will take to the streets to demonstrate our resistance to the new President of the United States of America. There will undoubtedly be some brilliant placards and, hopefully, a few witty chants. We will denounce Trump’s xenophobic, racist, misogynist rhetoric and condemn his efforts to enact policies that exemplify this, from the border wall to the “Muslim ban” to the Global Gag rule. We will also be marching to voice our opposition to the UK government’s decision to carry on with ‘business as usual’ with the government of the United States. 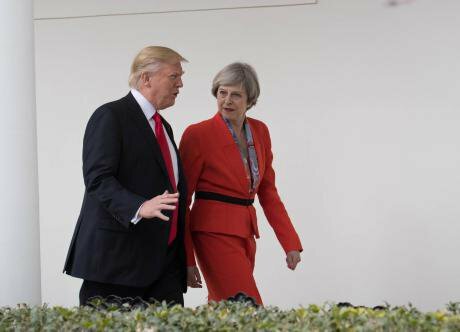 We will condemn Theresa May’s failure to stand up for basic human values in her response to the Muslim ban, and in particular, her decision to accord President Trump the honour of a state visit to the UK later this year. We will march to show our solidarity with those who are most directly affected by Trump’s policies and to speak up for the rights of refugees and migrants both in the UK and internationally. We will build momentum for a monumental show of opposition to Trump when he comes here, in what is being billed as one of the biggest demonstrations the country will ever see. But we should also be taking this opportunity to do something more. As a fractured international system cracks still further under the strain of each new pronouncement from the Trump White House, we need to be asking the UK government to undertake an urgent evaluation of the way it positions itself on the global stage. And specifically, we need to be asking it to explain how this positioning will contribute to promoting, rather than undermining, the global security on which UK security depends. A Special Relationship, or an Especially Problematic Relationship? The so-called “special relationship” with the USA has been the bedrock of UK grand strategy for defence and security since the end of the Second World War. This has reflected the establishment’s view that US leadership through NATO remains the primary anchor of stability in the international order. The out-workings of this alliance are evident both in the design of UK military capabilities and in the uses to which they have been put. UK military hardware investments are selected on the basis of their operational complementarity to those of the US. The UK Armed Forces are designed to provide particular capabilities for wider military coalitions led by the US, with cooperation extending as far as controversial shared involvement in US armed drone strikes. And inevitably, the UK has followed the US into a range of military interventions over the last fifteen years, from Afghanistan to Iraq to Libya and now Syria. Despite the devastating consequences of these interventions, the UK’s 2015 National Security Strategy and Strategic Defence Review recommitted to the grand-strategic relationship with the US, describing it as “our pre-eminent partner for security, defence, foreign policy and prosperity”. Amongst other weaknesses, the Strategy failed to acknowledge the increasingly accepted conclusion that these military interventions – and the US and UK’s roles in them – have contributed to precisely the kinds of security risks that we were told they would alleviate. It might have been possible to gloss over some of the more disturbing out-workings of the “special relationship” while President Obama was in the White House, but the arrival of Donald Trump creates an entirely new reality. The evidence of his first month in office suggests that the new administration is bent on policies that are likely to dramatically escalate the drivers of global insecurity, whether on climate change, US-China relations or violence in the Middle East, as Oxford Research Group has highlighted. The EU’s President Donald Tusk went as far as to describe him as a “threat” to Europe. In these circumstances, an ostrich-like approach to “business as usual” seems an extraordinary risk to take, both for the UK and the wider world. Instead of rushing over to Washington to talk up the “special relationship” and promising that the UK and the US will “join hands as we pick up that mantle of leadership once more”, Theresa May should be urgently re-considering the fundamentals of UK grand strategy. Otherwise, the UK’s approach to security risks continuing on a trajectory in which – at enormous human, ecological and financial cost – it exacerbates the very problems that we are told it is intending to address. Just a few months ago, questioning the UK’s grand-strategic alliance was almost unthinkable in mainstream foreign policy debates. But such is the level of consternation at developments in the US that it is being mooted with increasing frequency, and not only in liberal circles. In many ways, an in-depth review of the UK security alliances is long overdue. Global insecurity is growing. Violent conflicts are spreading and intensifying and refugee flows are at their highest ever levels. Economic inequalities are deepening and planetary boundaries are being breached. The preferred responses of Western governments – particularly the US and the UK – are manifestly failing to reverse these trends and have often made matters worse. The UK and its NATO allies account for half the world’s military spending, so the deficiency in Western responses is not a lack of military capability. Instead, as the Ammerdown Group’s Rethinking Security publication has argued, the problems lie in the dominant narrative about what security means, who it is for, and how it should be achieved. This narrative, which has its roots in the UK’s colonial past, privileges UK security over the security of people in other parts of the world. It emphasises short-term threats, rather than addressing the long-term, systemic drivers of insecurity. And it assumes that threats can be contained and controlled primarily by the projection of military force, exercised principally in alliance with the United States. But the problems arising from this posture are coming home to roost, and the Trump Presidency simply forces us to look a bit harder in the mirror. How long can the UK continue to brand itself as a “Force for Good” in a world in which its principal ally is enacting openly racist and Islamophobic policies? Or when the government justifies, on national security grounds, the decision to sell arms to a Saudi Arabian regime that is accused of war crimes in Yemen? Who is paying the price for the UK’s security alliances and what are the long-term consequences of this? If the UK government is committed to contributing to global security, now is the time to revisit some first principles and ask some hard questions. What does security mean? Who are the intended beneficiaries of UK security policy? How can we start to build the conditions of sustainable security and address the drivers of insecurity? Who do we need to work with in this endeavour and on what basis? The UK’s strategic decisions about its security alliances should flow from an urgent re-consideration of these questions. Can the juggernaut change course? It is, of course, far easier to ask the questions than to discern and implement a practicable change of course, not least because of the situation the UK now finds itself in. There is colossal military-industrial momentum behind current UK security policy, which is highly effective at locking the government into a series of arms treaties and investment programmes. And Brexit creates an additional layer of complexity, placing the UK in an awkward position as far as international relations are concerned. The most obvious alternative to the US-UK axis is closer cooperation with our European neighbours; this is a tricky card to play at a time when the UK is embarking on a difficult and potentially acrimonious exit from the European Union. These factors go some way to explaining Theresa May’s willingness to offer apparently unqualified support to the Trump administration. But they are not an acceptable justification. Plenty of other countries have demonstrated that it is entirely possible to take a different approach to the new US government, and to foreign and security policy more generally. Those of us who believe that our global security alliances should be based on shared values such as humanitarianism, justice, democratic accountability and principled multilateralism need to be pushing for proper debate about the options available. Without a far-ranging public conversation, drawing on the widest range of expertise and perspectives, there is a high risk of business as usual, with global security continuing to deteriorate and the most vulnerable people paying the price. So yes, our banners today should definitely be opposing the racism and xenophobia that have characterised the early days of the Trump administration. They should be challenging the normalisation of his agenda, and calling out our government for its own inhumane response to the refugee crisis. And they should also be asking for an urgent rethink of the UK’s approach to international relations, and particularly for a commitment to security alliances that work for the common good of all the world’s people.